European Commission chief Jean-Claude Juncker has urged UK to "clarify its position" on Brexit as soon as possible. He told the European parliament that Britain and the UK remained friends but it needed to state its position to avoid uncertainty. PM David Cameron is to meet European Union leaders for the first time since the UK voted to leave later on Tuesday. Mr Cameron has said it will be up to the next prime minister when to trigger the formal method by which a country leaves the EU, Article 50 of the Lisbon Treaty. "We need to clarify the situation as quickly as possible. But I'm still sad because I'm not a robot, a grey bureaucrat or technocrat," Mr Juncker said. "I'm a European and I have a right to say I regret the result of the British vote." Mr Juncker also echoed comments from the leaders of France, Germany and Italy that there can be no informal talks until Britain began the exit process. "We cannot allow a long period of uncertainty. There can be no secret negotiations. No notification, no negotiation," he said. He also said the will of the British people must be respected, prompting applause from UK Independence Party (Ukip) leader Nigel Farage, a key campaigner behind the leave vote. "You were fighting for the exit, the British people voted in favour of the exit. Why are you here?" Mr Junker said to him. Manfred Weber, the chairman of the European People's Party grouping in the European parliament delivered an angry rebuke to Mr Farage. Mr Weber said the "worst liars can be found amongst Ukip". He said Mr Farage had gone back on a pledge to fund the NHS with money taken back from EU contributions. 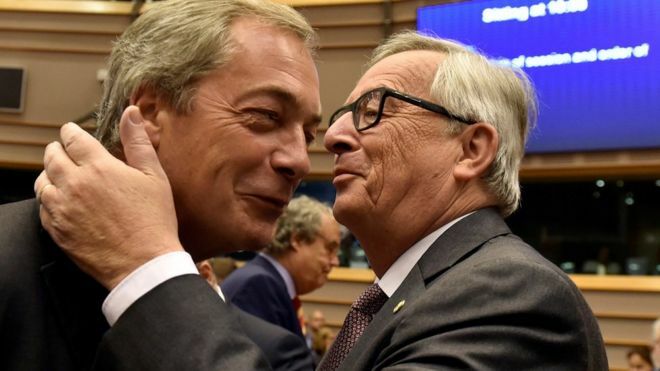 "Apologise to the British, shame on you," he told Mr Farage, adding: "Stop this populist Brussels bashing." Mr Weber also said: "The times of appeasement are over. We have to stand up for our European project." A strong Europe in an uncertain world or A European Superstate ? EUref Leave result euro zone news European parliament Jean-Claude Juncker has urged UK to "clarify its position"
Labels: EUref Leave result euro zone news European parliament Jean-Claude Juncker has urged UK to "clarify its position"
"achieving shared ambitions and assuring the sector that the government is committed to existing housing commitments"
000 people achieve their aspiration of home owner latest figures reveal. 10 winning ideas announced by NLA ! for Housing to help solve the London housing shortage. A pioneering collaboration between two North West universities has resulted in a successful world-first Graphene UAV aeronautic flight test. according to new figures released today by NHBC. Aldi Lidl shoppers won't jump ship to Tesco Ground Hog Day / Tesco wants its money back ? Borrowing figures in the mortgage market remain strong as customers take advantage of record low interest rates. Brandon Lewis Housing Minster MP announces new large scale custom build #custombuild #selfbuild #OwnYourHome #Basingstoke"
Can a doorbell really work as a way to help prevent crime ? Can Republicans really dump Trump? Democrat Hillary Clinton has become the first woman in US history to be nominated for president by any major party. Emoov.co.uk to enter US property market Could you sell your home without a real estate agent? Google has acquires Portuguese start up Digisfera. Houses & Flats for Sale Why Transparency is very Important for the Start Up of a Business? Housing and interest Rates a heads up ! Housing and Planning Bill Committee LIve ! interest rate rise may follow US . Is Battersea Park Roof top Gardens Harry Styles of One Direction > New Home ? Jean-Claude Juncker has urged UK to "clarify its position"
John Prescott says the invasion by UK and US forces was "illegal"
Labour conference: Sadiq Khan >"I'm going to make the election a referendum on London's housing crisis"
large red circles from cupping ? Mortgages Nearly one million "face difficulties"
New Housing and Planning Bill has been introduced to Parliament by the government. property online disruptor to quick sale homes ? Richard Branson warns estate agents - keep a close eye on how new technologies or changing consumer habits could threaten future income streams. Soul Singer turned property Developer transforming Liverpool for the better. the property / housing market 2016 ? the UK's leading architecture award. to privatise the National Health service. What do online sales mean for Tesco and CountryWide PLC Retail 2016 ? Wrong Wrong Wrong Trump !